The Right coronary artery (RCA) originates from the right coronary (RC) cusp and travels in the right atrio-ventricular (RAV) groove, between the right atrium and the right ventricle. In its very proximal portion, the conus and the sino-atrial (SA) node branch are given off. The right coronary artery then gives rise to the acute marginal branch that travels along the anterior portion of the right ventricle. The RCA then continues to travel in the RAV groove. In 85% of cases, the RCA is a dominant vessel and supplies the posterior descending branch that travels in the PIV groove. The RCA then supplies one or more postero-lateral (PLA) branches. In the remaining 15% of the general population, the Cx is "dominant" and supplies the branch that travels in the posterior inter-ventricular (PIV) groove. 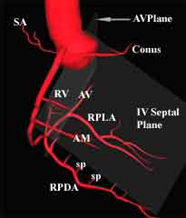 The acute marginal (AM) branch of the serves as the boundary between the proximal and mid portion of the RCA. Thus, the portion of the artery prior to the origin of the AM is known as the proximal RCA, while the segment just beyond the AM is the mid RCA. Thus in summary, the RCA travels in the right atrio-ventricular (AIV) groove between the right atrium and right ventricle, as it wraps around to the bottom or inferior portion of the heart. In 85% of cases, the Cx is non-dominant and the "dominant" RCA supplies the PDA branch. In the other 15% of cases, a dominant Cx supplies the PDA branch. ©1999-2010 A.S.M. Systems, Inc. All Rights Reserved, including design and all contents that include graphics and animations.